The Esplanade, pronounced es-pla-nade by CPR railroaders, others say es-pla-nawd! Once intended to be a grand esplanade or promenade 100 feet wide, along the waterfront when it was built in 1854, it soon turned into a mass of railway tracks as more and more railways fought for entrances into the City. Railway roundhouses, shops, stations, industries and wharves all filled the waterfront. 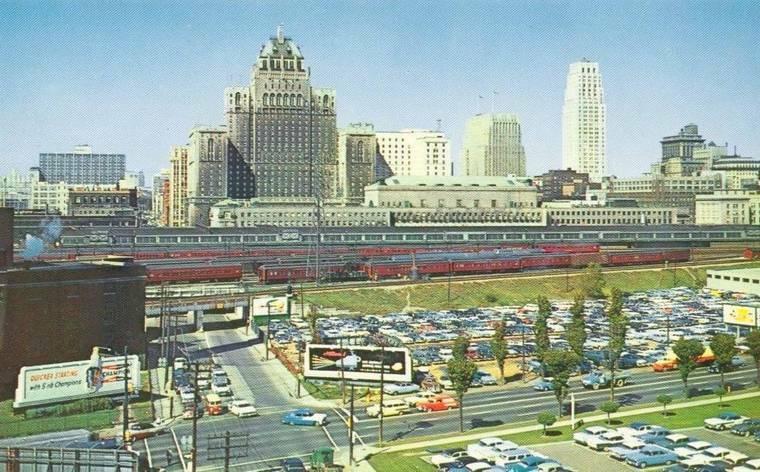 Up to 7 tracks wide, it ran from the Don River all the way to Simcoe Street changing at Yonge Street from The Esplanade East to The Esplanade West. Early years along the waterfront was all wharves to dock sailing vessels delivering coal and other cargo much of it for local use or delivery to other communities. Coal docks: 1893 photos. Construction of the Viaduct grade separation changed all this when it raised the main lines of the CNR and CPR up 18 feet to the High Level. The new (present) Union Station brought about the demolition of the previous union station and the elimination of the Esplanade West. 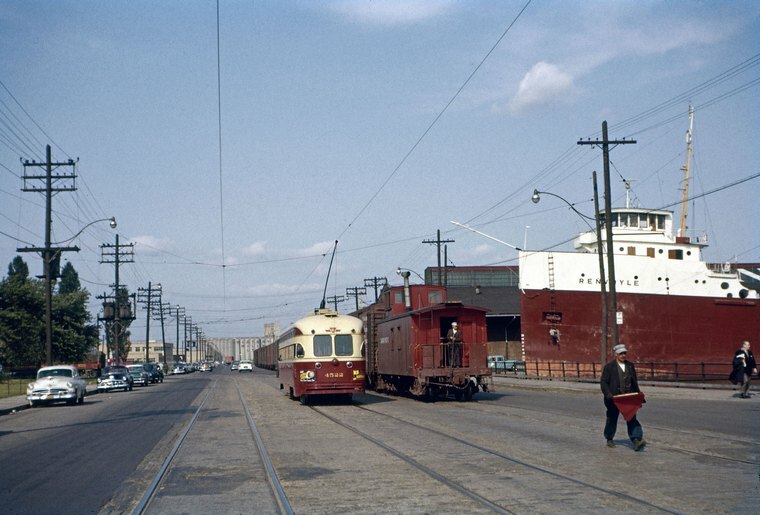 It also turned the Esplanade East trackage into dead end tracks stopping at Yonge Street, serving local sidings and team tracks for the large amount of perishable traffic. The old 1866 GWR four broad gauge track station with its unique arched roof train shed which had closed August 28, 1882 following the August 12th. amalgamation with the GTR. It continued in use effective August 31st. 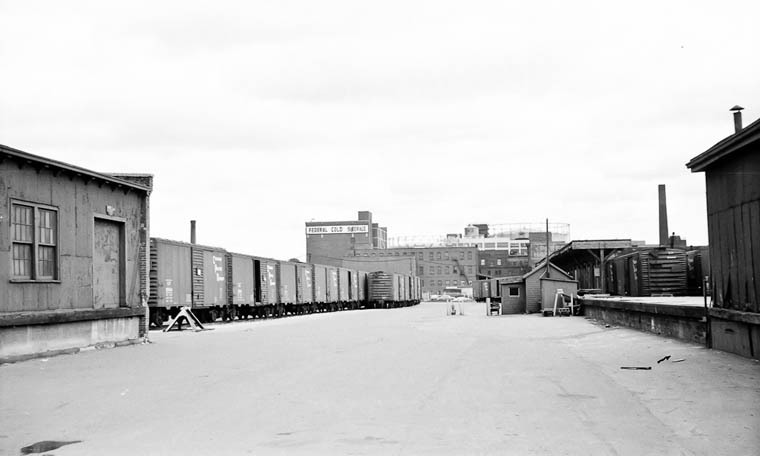 for bonded freight until new sheds were opened in 1904 at Simcoe and Front Streets at which time it became part of the Toronto Wholesale Fruit Terminal, until it was destroyed by fire May 17,1952. The Ontario Food Terminal was opened in 1954 as a replacement for the destroyed and inadequate facilities. Located on the north side of the CNR Oakville Subdivision east of Mimico yard it was a joint area that could be switched by both railways. See a later page for Swansea and Ontario Food Terminal. CPR tracks were cut back to the east side of Jarvis Street prior to 1972, still leaving access to George Street, but by 1986 it was all gone. So too was most everything at Cherry Street, the Pool Car operators all long gone, although the lead still ran as far west as Mill Paper in this mostly desolate and abandoned area of the city. All of this area, both CNR and CPR was in the 1980's the location of an ill-conceived City of Toronto residential redevelopment called "Ataratiri". After wasting millions of dollars expropriating businesses and acquiring land at this contaminated industrial area, it was abandoned as being hopelessly expensive to clean up and lays vacant. 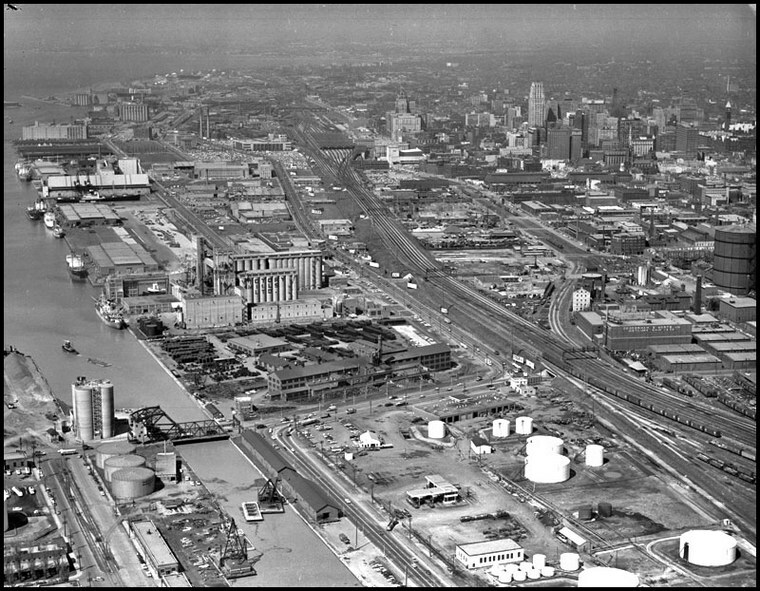 The Esplanade Jobs out of Parkdale Yard switched these areas 3 shifts a day, 6 and 7 days a week in the 1950's and 60's, gradually declining as industry left the area. 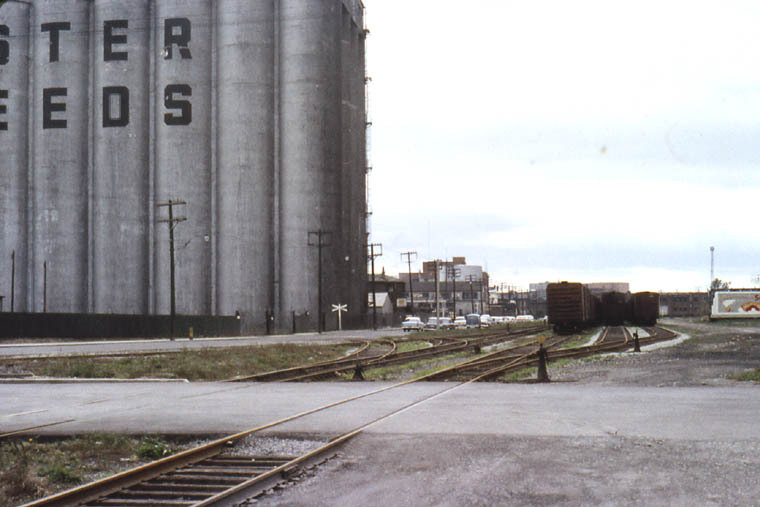 Cherry Street, located on Cherry Street between Front Street East and Mill Street, was for many decades the site of freight sheds and team tracks. It was accessed off the Don branch just before it turned west towards Union Station. A lead served a few industries, including Mill Paper, and once crossed Parliament Street. The south shed was built in 1900, and the north shed in 1913. By the 1950's one 4 track shed was used by Howell Forwarders a pool car operator. The other shed was rented out to Kreaver Paper. 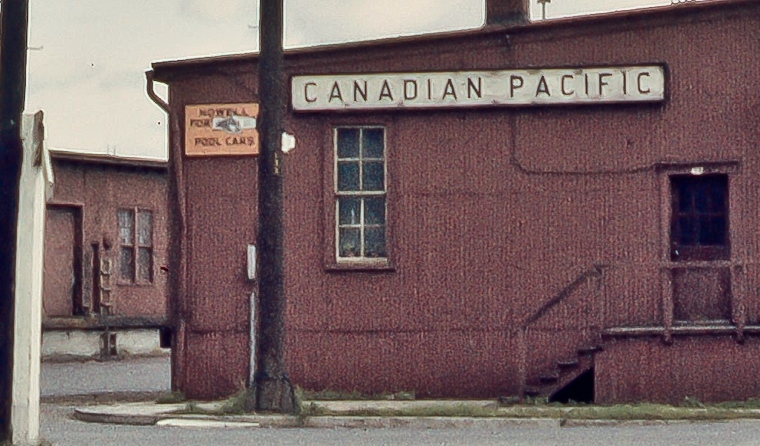 The CPR Freight Office had a small staff and was under the General Freight Agent at Simcoe Street Freight Office. Howell employees worked the shed. CN Interchange to and from local industries was handled at Cherry Street. 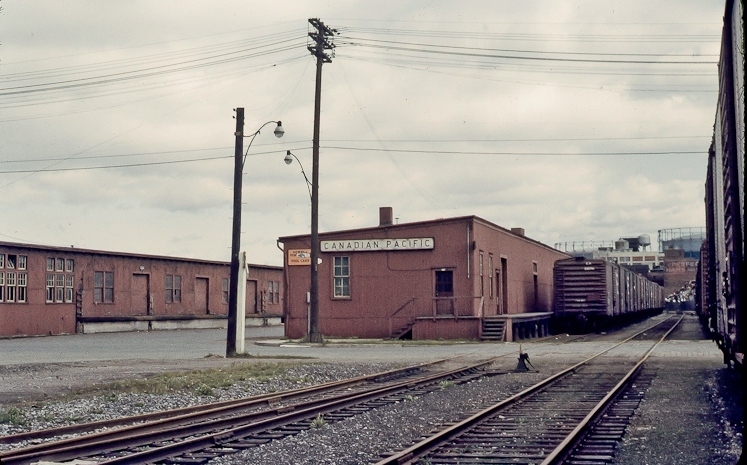 The traditional two tracks, one to and one from, were located in the CNR Cherry Street yard to the north of the CPR facilities, between Front St.E. and Eastern Avenue. 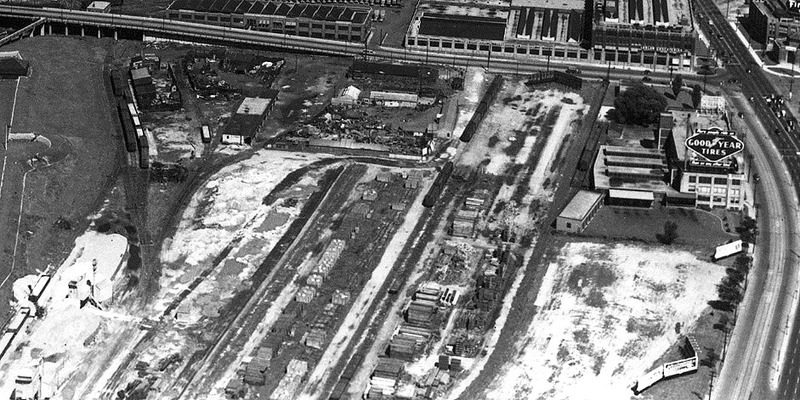 CN Cherry Street also contained a freight office, shed and team tracks. In later years the CNR also had another pool car operation south of the CPR up against the High Level. George Street was a small team track area with a freight office for local customers, located along the south side of the Esplanade. Ashbridges Bay, more correctly Ashbridge's Bay, but referred to variously as Ashbridges Bay, Ash Bay, A Bay or just "the Bay", this industrial area on the waterfront was created by filling in the harbour where a 1300 acre marsh existed, between June 1914 and 1920. (Polson Quay was added in the 1930's). Here, piers for lake boats delivering coal and oil to wholesale distributors, as well as building materials, were busy for many decades. 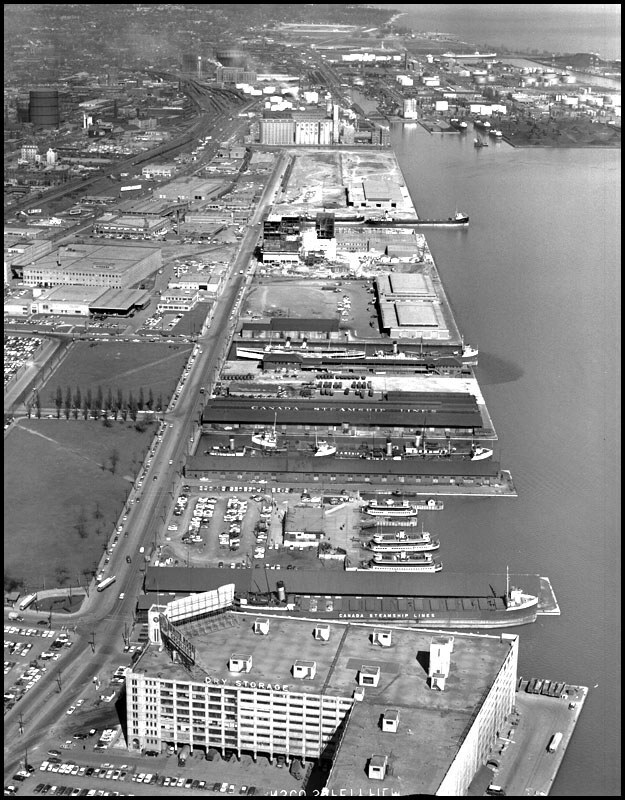 Warehouses and cranes for ocean cargo are located at the west end, added over the post WWII years up to the last one, (Pier 52) in September 1970. The first industry was the British & American (B/A Oil) refinery at Keating and Cherry Sts. Later came two other refineries, Imperial Oil and McColl-Frontenac (Texaco), the largest. By 1931 there were 41 industries here. CP's access was from the High Level east of Scott Street Tower down and across Lakeshore Blvd.East. 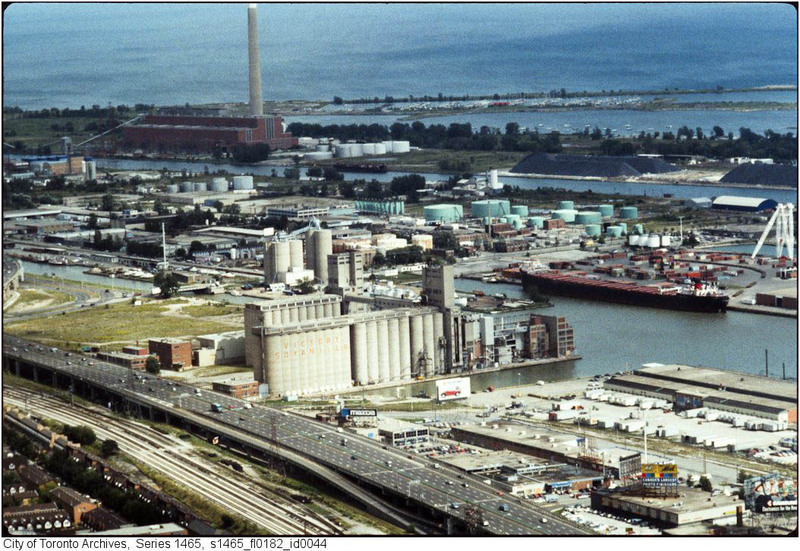 CN's access to the Bay was a lead from the CN Don Yard down a steep grade to Lakeshore Blvd. East crossing it west to east. Toronto Harbour Commission owns all the trackage in Ashbridge's Bay as well as along the Wharves. The area is jointly switched by CN and CP with cars being handed over to each other in THC's Keating Yard located just east of the Don River on the north side of Lake Shore Blvd. East. Basin Street (switched by CN) is the location of the last in-street switches in Toronto. To keep out of each others way, CN and CP have always agreed to switch certain areas and just hand cars over to the other railway without formal interchange. So heavy was the switching in the 1950's and 60's that it required three CPR jobs. The Day Bay was out of Parkdale Yard while the Second Ash Bay and Afternoon Bay Job started and finished at the Coach yard to save travel through the congested Union Station area. These cars were later lifted and taken to Parkdale, where connection was made with fast freights or the transfer to Lambton for much of it which generally wasn't rush traffic. Next to Keating yard is the massive Lever Brothers (Sunlight) soap plant, still a busy plant it is one of the very few remaining industries in downtown Toronto using rail. It still gets switched twice a day, CN on days and CP on nights. Note: Unilever sold out in August 2002 to Korex which operated the plant producing some Lever product and private brands. Korex Don Valley filed for bankruptcy in August of 2009. 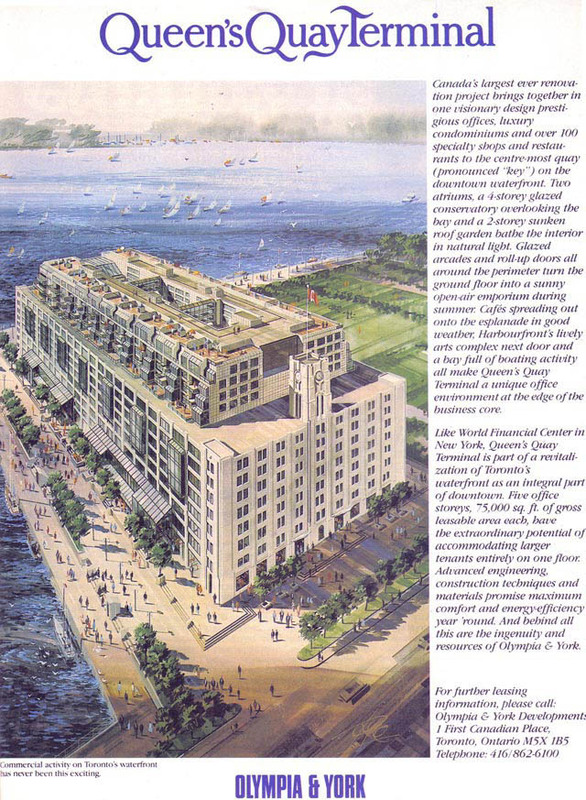 The 28.5 acre property was sold in January 2012 and a massive development for 70,000 office workers is proposed by First Gulf. The East Wharf Job (a.k.a. Victory Mills job) out of Parkdale yard switched this area and in diesel days was very unique. MLW 660HP yard switcher 6584 was equipped with basic operating controls on the left side of the cab to switch Victory Mills as their trackage curved opposite to all other sidings, thus heading the engine in the opposite direction wouldn't help. Of course firemen had been eliminated from yard jobs. 6584 was the only diesel in all of Canada so equipped. Victory Mills in center with Dominion Malting directlly behind. Looking east to Ashbridges Bay. East Wharf is the area west of Ashbridge's Bay south of Lake Shore Blvd.E. along the waterfront starting with the huge Victory Mills and Dominion Malting elevators. Victory Mills began as Sunsoy Products, a division of E.P.Taylor's Canadian Breweries Ltd. It became Victory Mills Ltd. and when the plant opened March 27, 1946 it was the largest soybean extraction and processing plant in Canada. Soy meal is animal feed and pet food products. 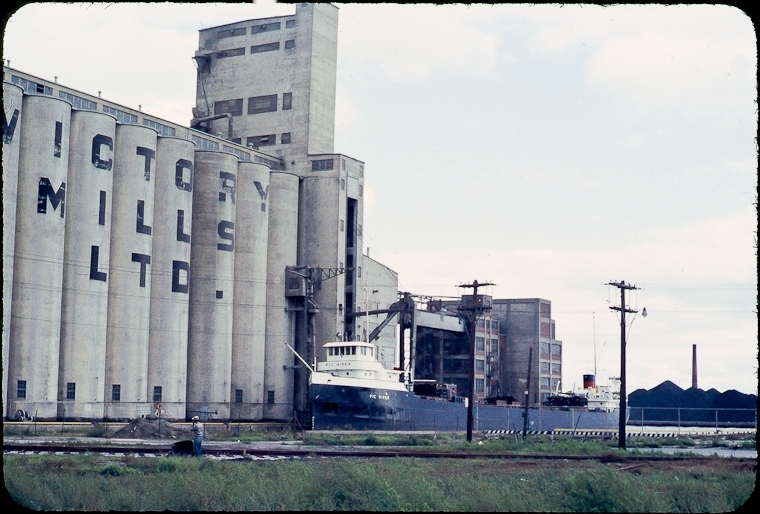 Renamed Victory Soya Mills in 1954 by new owner Procter and Gamble Co. It was sold in 1984 to Central Soya Inc. Fort Wayne, IN. and closed in March 1991. 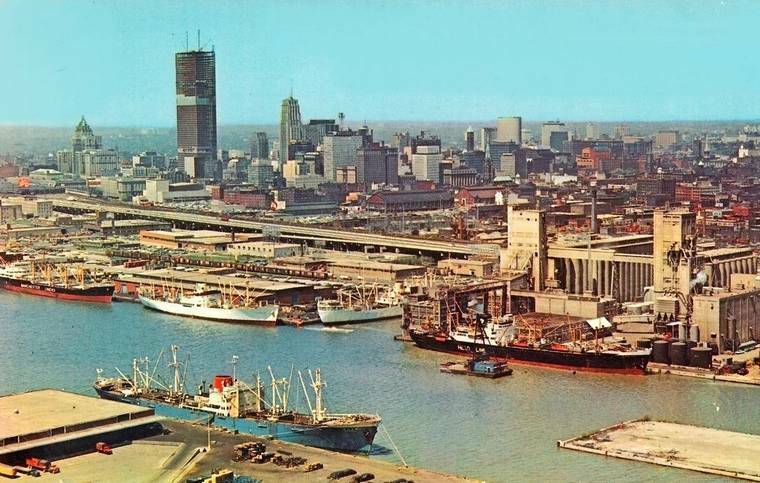 The last industry built along the waterfront was opened in 1959 at the foot of Jarvis Street, (95 Queens Quay East) the Canada & Dominion Sugar (Redpath Sugar) refinery. Raw sugar is received by ship. Refined sugar is shipped by rail and truck. (Note: Rail service ended in October 2008 and the tracks were removed starting in November all along Queens Quay east to Parliament Street). The lead was dead-ended at Redpath in 1985. Near here a lead crossed Queen's Quay (street) to reach an LCBO bonded liquor warehouse and the Toronto Star newspaper where a 4 track plant referred to as Star Freeland (Freeland Street) shipped on Saturday night the Star Weekly, a large colour magazine. Passenger Express box cars were used to ship these papers as mail, first on #5, which closely followed The Dominion, later on 965. This required a special move by the Parkdale Lead engine to run down through Fez City to get these very rush one or two cars. The Star Weekly stopped being printed and The Star Freeland operation was closed. The daily Star, and other newspapers, for many years received rolls of newsprint at the Peter Street Paper Shed next to King Street Shed. 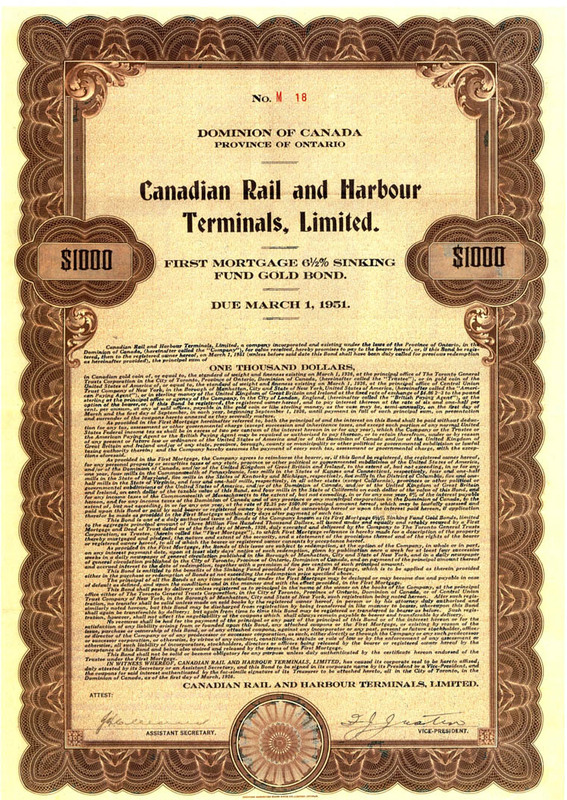 The LCBO has not used rail for many years. The lead originally continued beyond Freeland Street running in the street along the south side of Queens Quay where at York Street it went into a center of the road private right-of-way as it continued westward towards Bathurst Street. 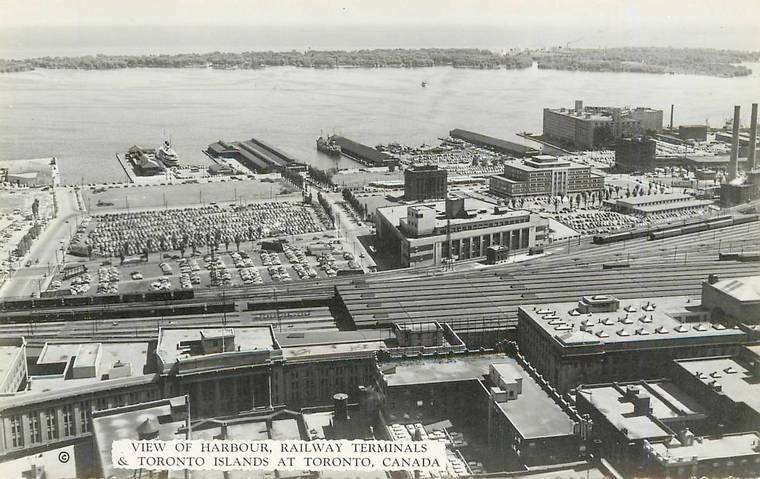 Queen's Wharf was the earliest Toronto waterfront area first served by rail, the Ontario, Simcoe & Huron (later, Northern Railway of Canada). Later, the Grand Trunk built facilities at the southeast corner of Old Fort York served by their line west to Parkdale, Weston and Stratford. When these small facilities were no longer required, they were leased by the Toronto, Grey & Bruce and later taken over by the CPR following its acquisition of the TG&B. The area west of Yonge Street was switched by the Queens Wharf Job out of Parkdale (3 shifts). The wharf lead began at King and Atlantic in Parkdale yard behind Hinde & Dauch Paper. This was the old TG&B and it crossed the old GWR Toronto-Hamilton mainline. 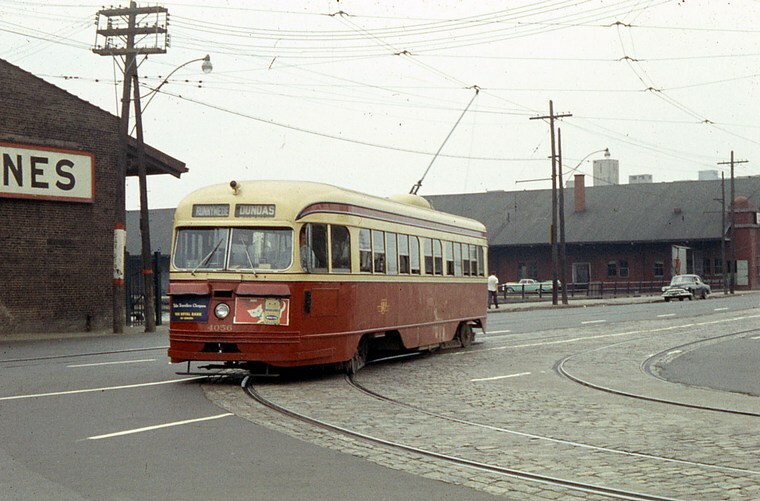 This diamond was controlled by the CNR's Cabin E. The CNE sidings ran west off this lead on the south side, which continued past Old Fort York and Fez City yard. 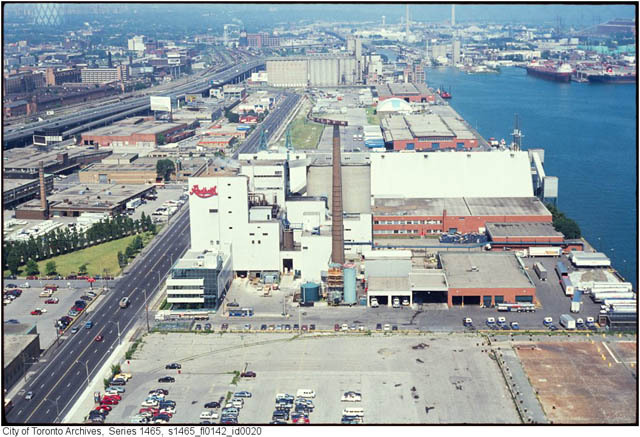 Molson Breweries was also located here for many years. Old aerial view of Fez City area. The track ran underneath Bathurst Street bridge where it met a CN lead out of Bathurst Street Yard. From here on it was all Toronto Harbour Commission trackage. Loblaws warehouse with an indoor track was here from 1928. It was built on the site of the old Queen's Wharf. 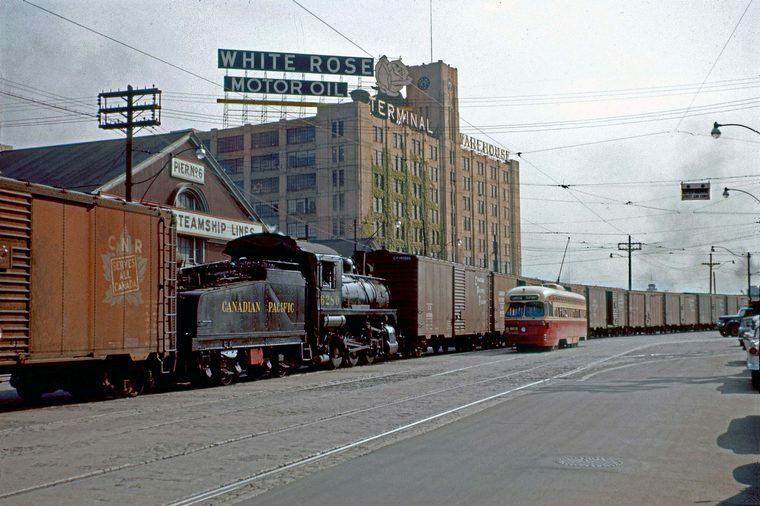 The lead crossed Lakeshore Blvd.West where Canada Malting (1929-1987) had elevators, then at Spadina Ave. was the 3 track Spadina yard used only by CN, here too were 6 tracks serving Maple Leaf Mills. 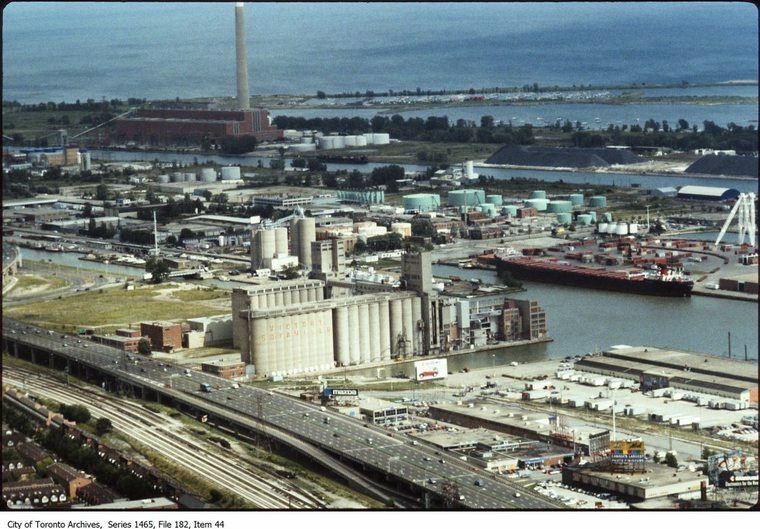 Opened November 21, 1928 as Toronto Elevators, a two million bushel facility that was later doubled, it became MLM in 1961, was closed in 1983 and demolished. At Rees Street opposite John Street was the 8 dead-end track Rees Street yard used only by CP. Here the track entered a center of the road right of way. Next came 5 sidings serving the massive Terminal Warehouse, a cold storage facility. Built as Canadian Rail & Harbour Terminals Ltd. on 14.5 acres of reclaimed land at York Quay and opened in 1928, it contained 1 million square feet of dry storage in its 8 story structure. 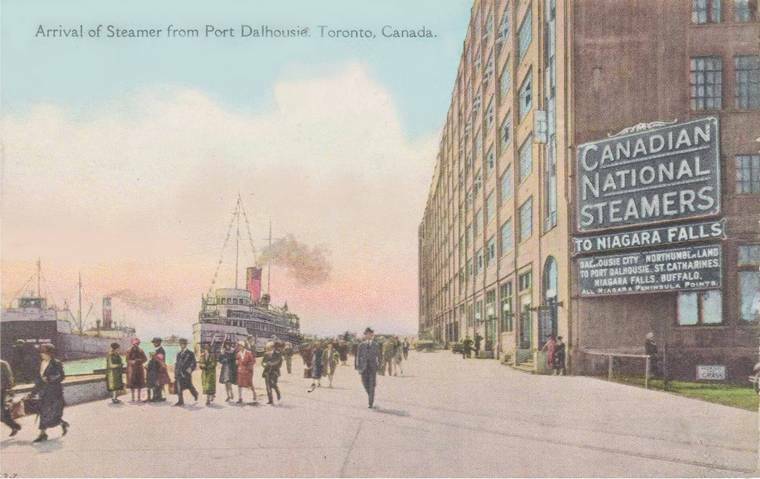 In 1936, new owners re-named it Terminal Warehouses Ltd. and built next door to it at Pier 5, facilities for Direct Winters Transport, a large trucking company. 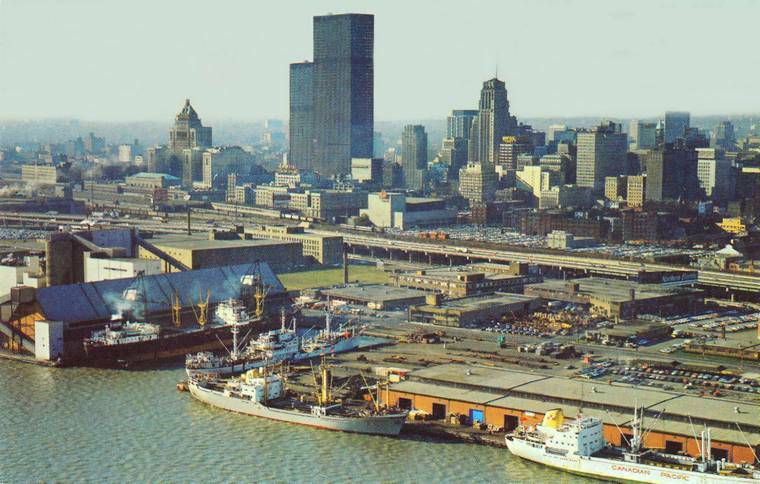 It eventually closed in 1980 following which it was rebuilt into a fancy retail and residential condominium known as the Queens Quay Terminal, opening in July 1983. At York Street the track went into the street and along the south curb lane of the Queens Quay past Yonge Street becoming the East Wharf. This track was removed beginning May 20,1985 after which it was necessary to go via the High Level and down towards the Bay to backtrack to Redpath Sugar. Lakeside Park, Port Dalhousie and Hanlan's Point, Toronto Island. 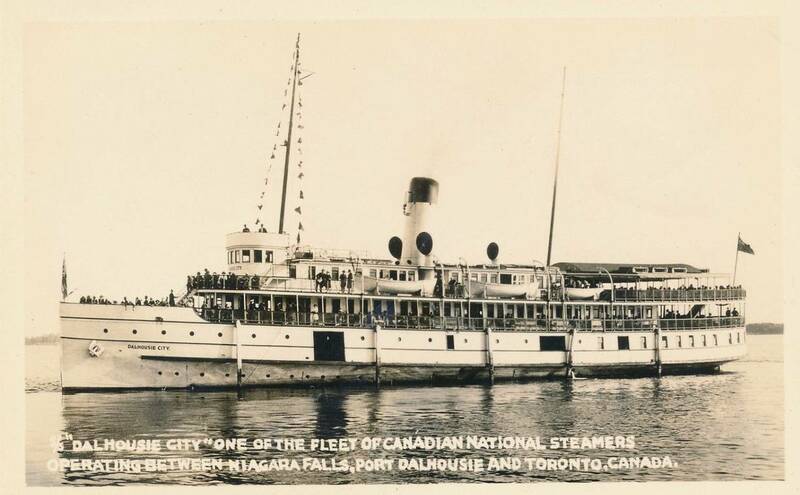 Other steam boats also plied the waters of Lake Ontario including the well-known Cayuga that steamed for decades. replaced steam and changed from the TTC Ferry Dept. to City of Toronto Parks Dept. They still operate today. TTC 4056 swings north onto Bay Street heading to Runnymede loop next to Lambton Yard. 1:30 p.m. Saturdays and all day Sundays and Holidays instead of the normal looping at City Hall. August 1960 Paul Mc Grane Collection. Aerial view looking north. 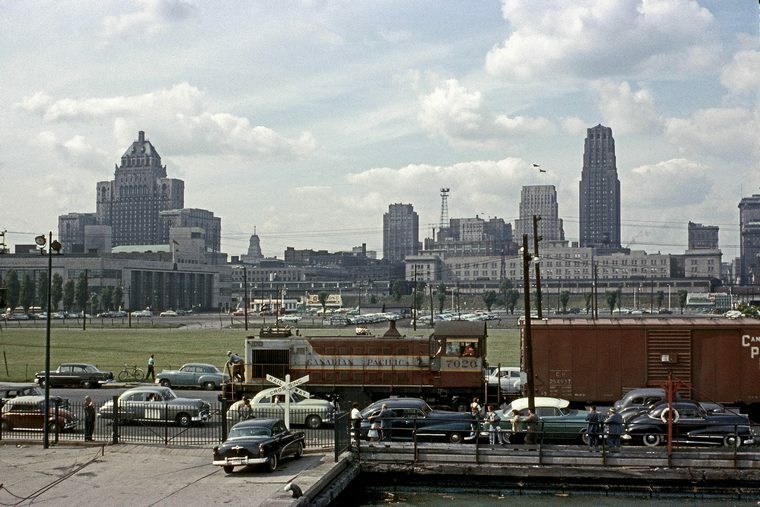 1950's Queen's Quay area of above photos of 7020 and 6280. Center; Canada Steamship Lines freighters either side of Island ferry. White building in center is main Royal Mail postal facility. Union Station and Royal York Hotel beyond. 1931 until 1962 the tallest building in the British Commonwealth. Twin tall stacks at far left are part of Toronto Terminals Railway's Central Heating Plant. 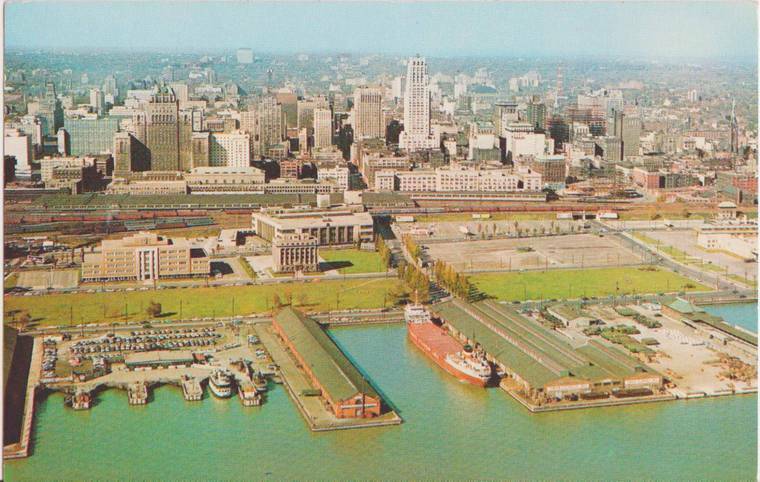 Aerial view Queen's Wharf with four freighters at dock including a Canadian Pacific ship at far right. 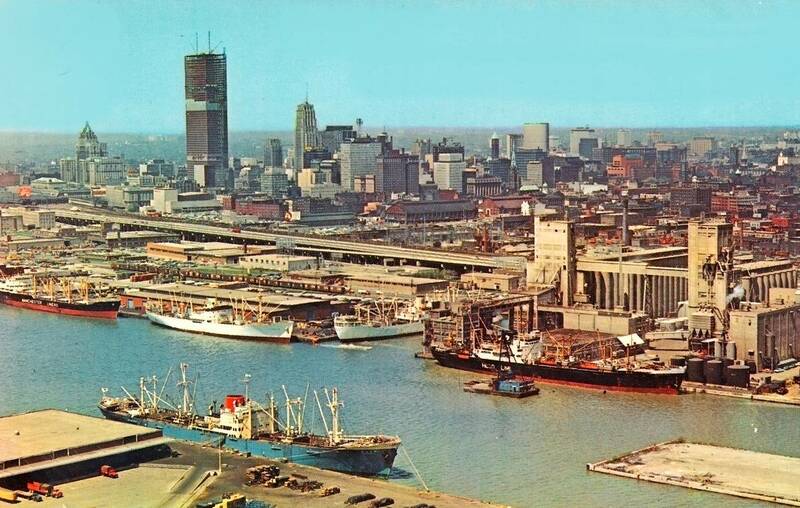 Gardiner Expressway has light traffic in this 1970's scene. 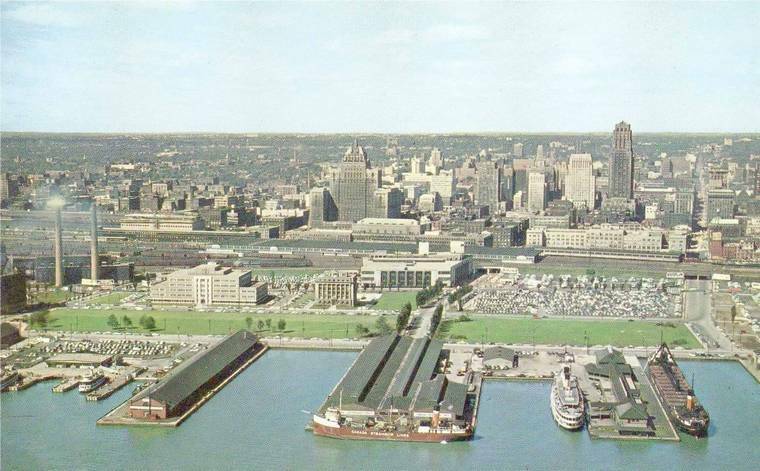 For many decades Toronto's waterfront was shared by people and commerce to the benefit of all. by some to rid the area of anything industrial replacing it with highrise residential buildings. Next: Union Station, Coach Yard and John Street.